I’m working in a scene for a mapping involving a water splash in a facade. I did the simulation with realflow and hybrido,with a second pass for splashes. I rendered the water using a PRTloader in 3dsmax, reading the bin files from realflow and meshing it with Frost. I imported the splash with a PRTloader, and rendered with krakatoa. There is a little problem, the splash particles appear in only one frame, to solve it I used a magmaflow to fade in some frames. 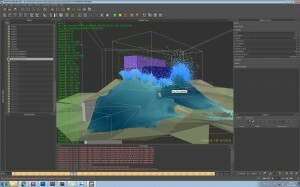 The splash sim takes 40 hours to simulate in a Q6600, 3,5 million of particles and 90Gb of sim.